Information providers, knowledge workers, research managers, and subject matter experts work together as an interdisciplinary community to enable, provide and improve access to a robust network of information resources and services for transportation professionals. 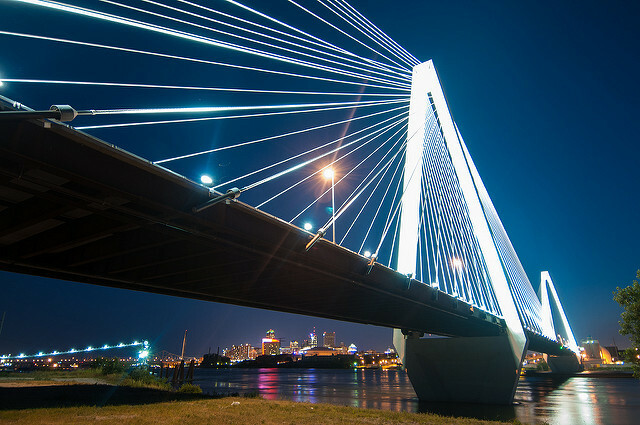 Stan Musial Veterans Memorial Bridge in St. Louis, MO. Courtesy of Missouri Department of Transportation. The purpose, or mission, of the Midwest Transportation Knowledge Network (MTKN) is to provide support, guidance, and leadership in the development, curation, and dissemination of information and data necessary for the furtherance of research in the field of transportation. MTKN works in a complementary and symbiotic manner with the National Transportation Library, the Eastern and Western Transportation Knowledge Networks, and other like-minded groups to achieve the overall goal of a unified and strengthened transportation-information infrastructure. The MTKN was the first group created as part of a larger effort to form a National Transportation Knowledge Network. MTKN has been successful in coordinating community efforts and implementing a wide variety of projects to improve access to transportation information. The MTKN boasts a broad membership from multiple backgrounds. Currently, seventeen members across nine states utilize the MTKN as their regional source for transportation information. Contact us to learn more about becoming an MTKN member.